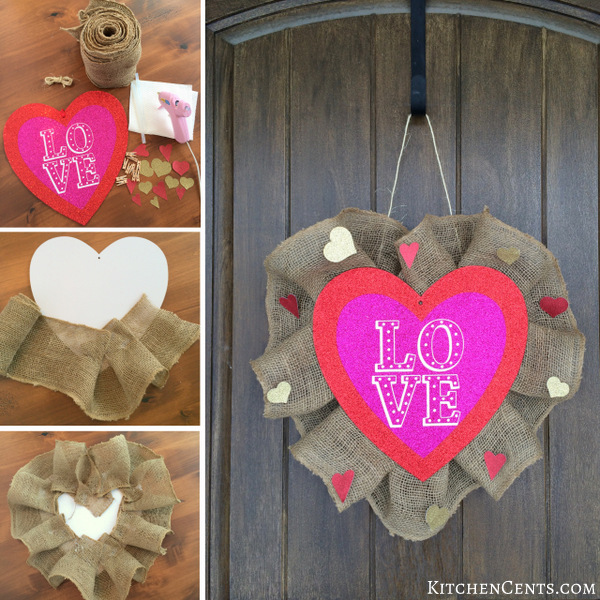 With Valentine’s Day just around the corner, I thought it would be fun to share this really cool, inexpensive Easy Valentine’s Glitter Heart Burlap Wreath. It only cost me $5 to make. Serious! It was a spur-of-the-moment idea that went totally right with gold hearts and everything. The rustic burlap around the red and pink glittery heart in the center makes this wreath fun and festive. 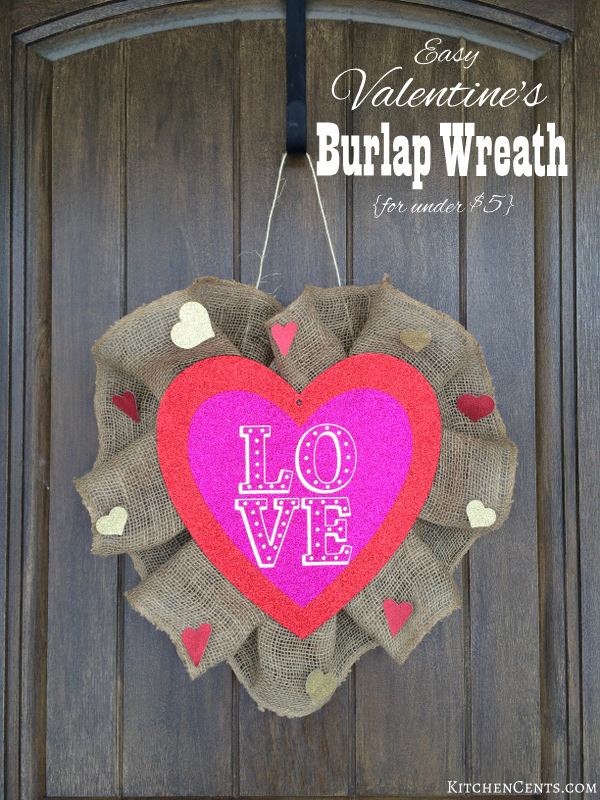 Adding some cute red and gold paper hearts on the burlap makes this wreath perfect for Valentine’s Day. This wreath would make a wonderful addition to your front door or as a pop of color inside. It would also make a fantastic Valentine’s gift for a teacher, neighbor or friend. 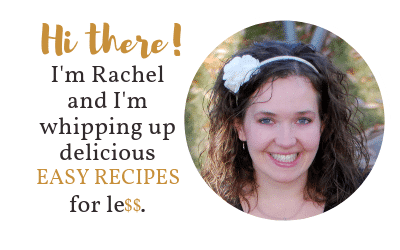 It’s so simple you’ll LOVE it! I made two of these wreaths, one for my daughter to give to her preschool teacher as a Valentine’s gift and one for myself to add a pop of Valentine’s color to an interior door. It was totally worth the 5 dollars each. This idea came to me as I was wandering around our local Dollar Tree store with my daughter. We spotted the cute glittery LOVE heart sign and figured it would be a nice, inexpensive way to add some Valentine’s colors to an inside door. I went right home and hung it on our white coat closet door. After looking at it a few times, I was a little disappointed at how it looked. It was cute and sparkly but was still lacking something… BURLAP! 🙂 So, I headed to my craft room to see what I could find. 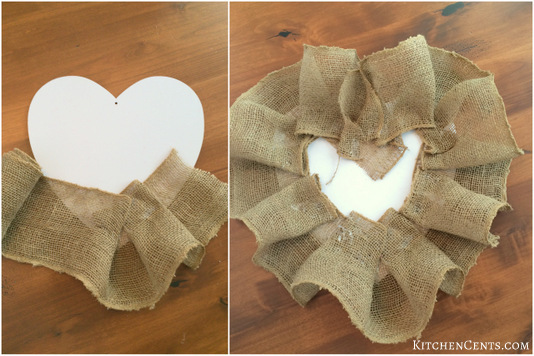 This burlap wreath was actually quite simple to put together. I picked a place on the back of the LOVE sign to start, placed a small line of hot glue, and glued the burlap on fold by fold. I used a simple double fold-over style, but you could definitely get creative with how you glue the burlap on. The backside of this project looked pretty bad but that was ok because the front is what mattered, right? 😉 Once it’s hung no one would be the wiser. Once I had all the burlap attached, I wanted to add just a little more glitter for that extra flare. 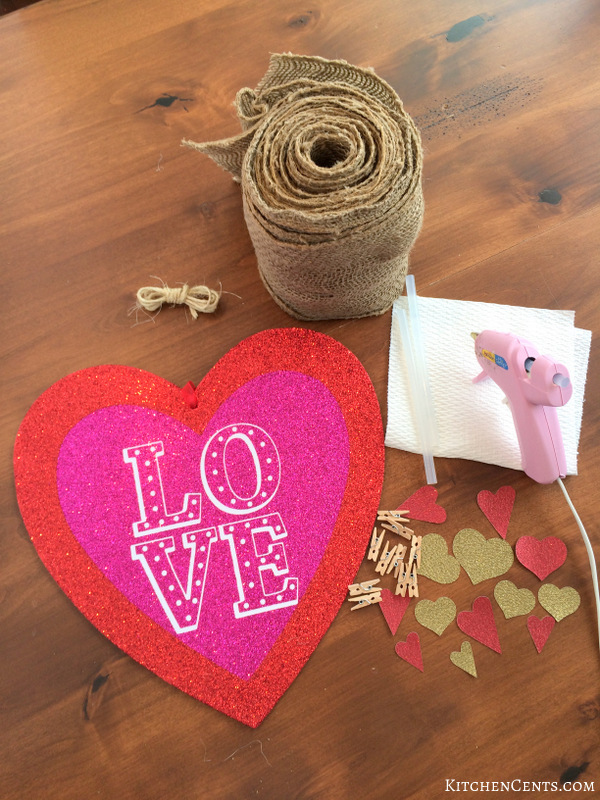 I decided to attach tiny paper glitter hearts all around the burlap. The red and gold glitter paper hearts added such a cute addition. It really gave it that finished look. I used my Cricut cutting machine to cut out the hearts. If you have access to hearts or other Valentine shapes such as lips, XOXO or other love words, you could totally make this your own style. 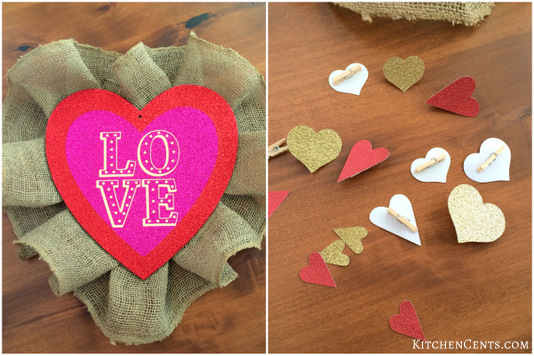 Also, you could either hot glue the mini hearts straight onto the burlap or use mini clothespins to attach them. I really liked the idea of mini clothespins so I could move and rearrange the hearts if I wanted. After the wreath was done, I removed the red ribbon from the original LOVE glitter heart sign, then hot glued a piece of twine to the back. That’s it! 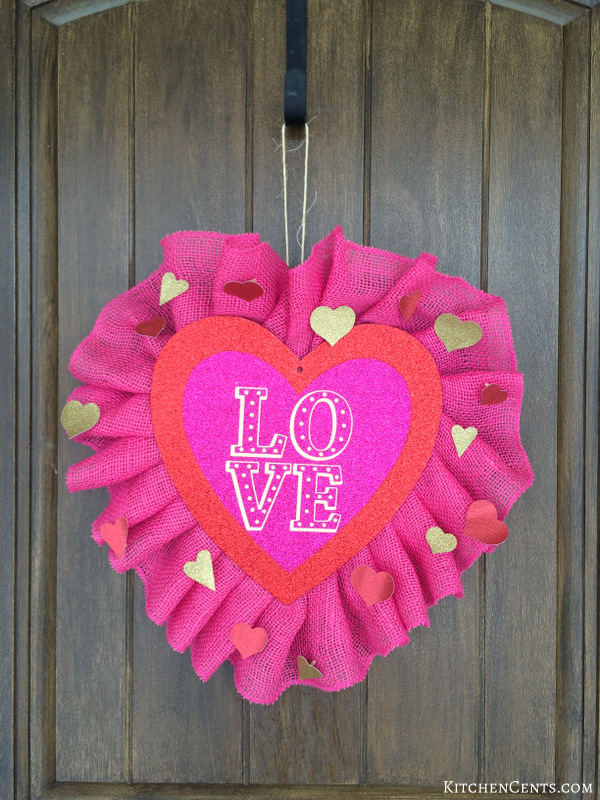 I hung it on the door and Ta Dah, a pop of Valentine’s magic under 5 bucks, glittery hearts and all. What do you think? 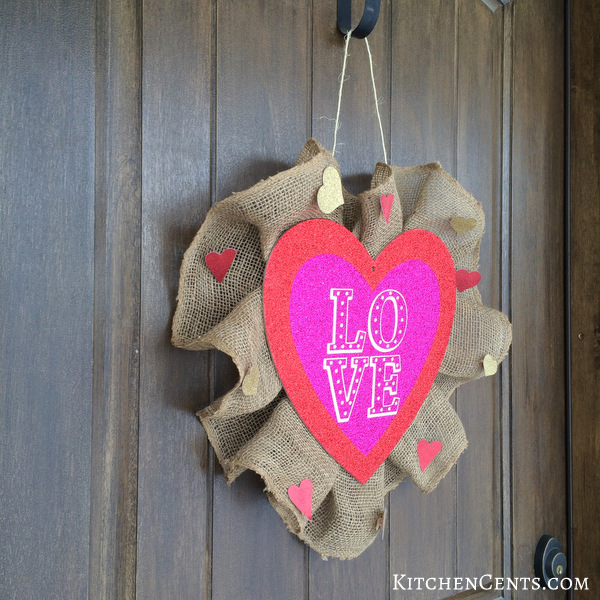 I hope you have as much fun as I did making this easy Valentine’s glitter heart burlap wreath. It’s a perfect way to bring some of that love-y dovey spirit into your home this Valentine’s Day. Do you have any big plans for Valentine’s Day? * I shared the original wreath tutorial on NoBiggie.net. 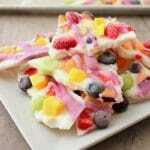 So quick to make and you can’t beat the cost to make it. 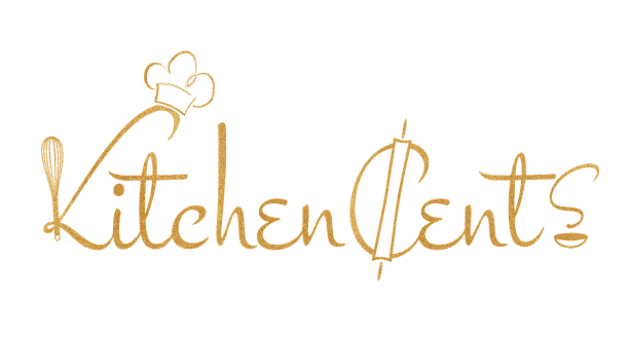 I’m going to make obe for my kitchen and give one to my neighbor. It’s a fun easy little DIY. Your neighbor will love it. I’d love to see pictures! Thanks for stopping by Debbie! So cute! 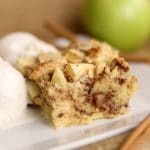 Love this idea and especially because it’s quick and cheap! 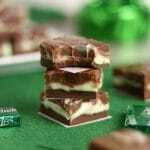 Very nice and simple gift, i will definitely make one and gift it to a loved one! This is such a cute idea. So fun for valentine’s day.